This session is about coming alive - being ignited with God. Sometimes you'll hear people talk about 'revival'. This is when God's people come alive or when God moves in incredible ways in a city, place, or even a nation. This has happened thousands and thousands of times, starting mostly in the early 20th century. This session is about us coming alive - God reviving us - revival. This is also about us staying full of God - something we'll call "alival" - God's life staying in us and shining through. In India in 1905 there was a move of God where one girl seemed to be on fire and another went to throw a bucket of water over her before she explained it was God. One UK pastor went out to Brazil and went with local Christians to pray in a forest. As they were praying, the trees and branches lit up with flames. They were able to pick up the branches while they were on fire and they were not burned. In the Asuza Street Revival in LA in the early 1900s, William Seymour would encourage the people to sing in tongues and the fire of God would physically go up from out of the roof of the church. Many times the fire brigade were called by people outside the church as they saw flames from the roof of the church. But it was the glory of God, not a real fire. This was also the time when the most miracles would happen. We don’t seek after these experiences but it shows sometimes in the natural what is really happening in the real world – the world we cannot see – the spiritual world. 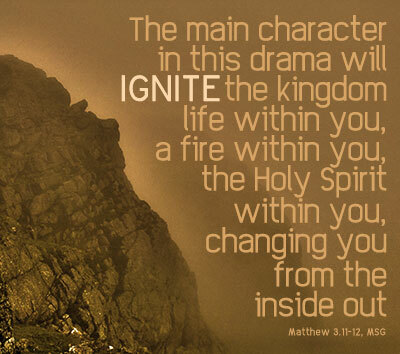 The kingdom of God is the life of God on the inside of you and through you. It's the place where we see God's will getting done. God changes us to be more like him and demonstrating through you to others that true life is found through God. If you're a believer in Jesus then God has designed you to be filled with him and to leak him out of you, on purpose and even by accident! The kingdom of God is a place where God’s truth, goodness and right ways show up in the physical world and make things better. If you want to know what the Kingdom of God looks like in physical form and in practice, look at Jesus. Don’t believe anything people say to you about God that you don’t see in Jesus. Set a fire down in my soul, that I can't contain and I can't control. I want more of you God, I want more of you God. It’s time to make a change, to re-arrange and make the flame burn once again in God’s house, make it like a lion, not like a mouse. Time to throw out empty lifestyles for what is worthwhile… Be amazed by the rays that will shine with God’s light. Revealing the darkness and making it bright. I'm sure you can come up with something just as good or much better ! Jesus told his disciples that when the Spirit of God came it would be like streams of living water coming from him (John 7.38 quoting Isaiah 44.3) The olde King James Version translates this as saying that living water will come from the belly. The word used for 'belly' is the same one used for Mary’s womb in Luke 1.41. A womb is a place where a pregnancy takes place and God forms a human life out of a seed. Joyce Meyer says that when we become a Christian and say yes to Jesus, the Holy Spirit 'gets us pregnant' with the seed of God. But like any seed, this needs nurturing, care, water, life in order to grow. 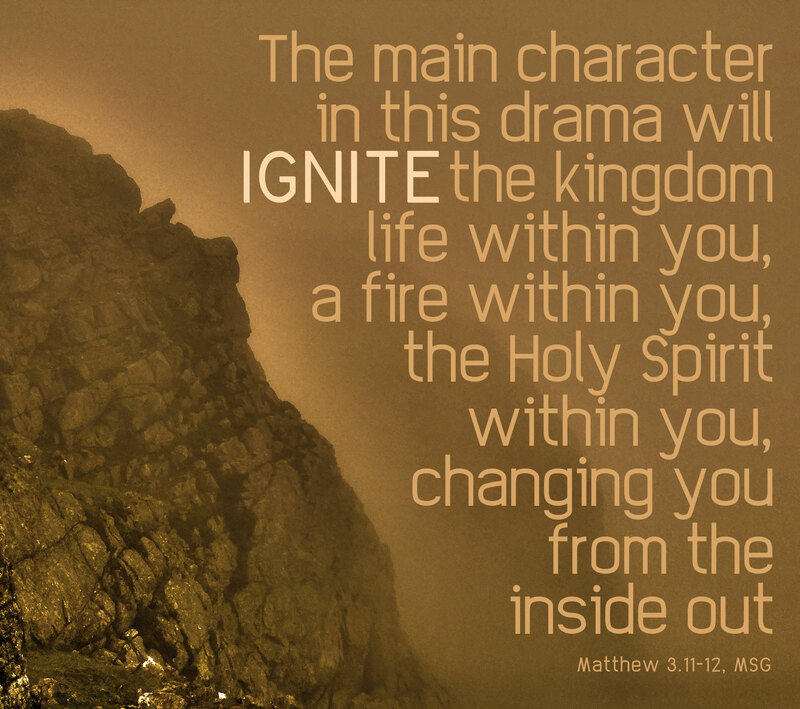 That is what the Holy Spirit - the flame of God does in us. But we also need to fan the flame. In Luke 24, two disciples were walking along a road to a place called Emmaus when they were joined by someone who turned out to be the risen Jesus. Their story was that when Jesus spoke their hearts burned within them like a fire. This is what happens when God is really alive in us and we get into his presence and Word. How do we fan the flame? Jesus said to the church in Revelation – be hot or cold, just don’t be lukewarm. He also said to grow in our gifting, to seek his kingdom first, to seek spiritual gifts, to return to our ‘first love’ (Jesus). Romans 13,14 tells us to ‘put on Christ Jesus’… This shows that we have a part to play! Listen to this song and while it's playing, ask God to speak to you about how you can really be on fire for him and let his goodness shine through you. So what would it look like to really be full of God? Get into groups and think about the questions on the sheet. 'Revival' means seeing God move in amazing ways to change places, cities or even nations. All of these things have happened through history across the world, even in some places today - so there's no reason we can't see God do this again where we are! Make sure that in groups, you pray for each other - for more of God or for the fullness of God inside of you to break out and stay out! Alternatively, if you're reading this we have 3 copies of the journal to give away. First come first served. Just email us with your address. UK only.